Julie, your card is adorable! Love Tilda's pearl jewelry and sparkly shoes! You did an amazing job. Beautiful! I'm sure these will go quickly! Oh wow, this is gorgeous! I love the pink and brown together and your maggie is adorable. I hope it brings in a lot of money....you deserve it. Beautiful card! Love Tilda and the papers and coloring are gorgeous! Good luck with the sales! I would imagine they will sell very quickly! This is Beautiful!!! Love it! Love the colors, just so pretty! Oh so cute! Loving your color scheme and yournshading is wonderful. Tilda all dressed up in pink and pearls.....sooooooooo cute. Julie, this is beautiful. One of my favorite Tilda and fabulously coloured. Love the colour combo. Gorgeous flower. This will sell in next to not time. Love it. Hi Julie! How cute she is! I love, love, love your coloring and embellishments!!! Gorgeous card Julie. Love the colors. I love your card. It is so sweet! Beautiful! The only problem you'll have selling your cards is keeping up with the demand! Very beautiful card, I love all the colors with the elegant embellishments. Beautifull card ! And I love the papers you used ! WOW this is just gorgeous!!! This Tilda is soooo cute and I love the way you colored up her dress!! Gorgeous details and colors! I am sure your coworkers will LOVE your cards! 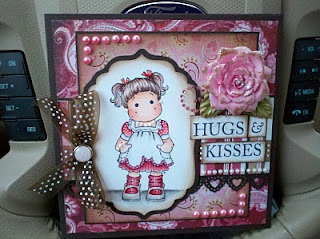 Adorable card with lovely colors and a fabulously colored Tilda! Julie, this is absolutely gorgeous. So many fabulous details and your Tilda is colored to perfection. Stunning work! Gorgeous! Love that paper! Beautiful card, you'll have the entire collection of Maggies selling card like this cutie! Hugs and kisses to you too! What a pretty card! !